The signing ceremony for IP cooperation between The Magic Castle and NOVAEX GROUP was held on May 25 in Beijing. 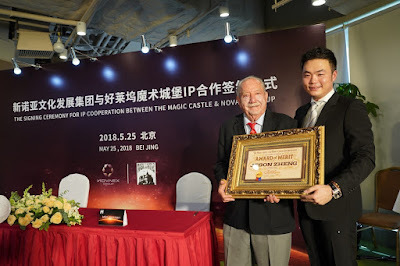 After the castle was built over a century, this is the first time that the world famous Magic Castle licensing its IP to any country outside the USA. The Hollywood Magic Castle was built in 1908 and is located on Franklin Avenue in Hollywood, L.A. This is a place where world top magicians and the most miraculous "magic" gather, it is also called the realistic version of "Hogwarts." It is a supreme honor to perform at the Magic Castle for magicians from all over the world. The NOVAEX GROUP that is partnering with The Magic Castle is an emerging innovative group enterprise newly established and focusing on cultural industry development. With the halo of the top IP of the magic, NOVAEX GROUP will establish a world-class magic team to extend magic to deeper value exploration and broader innovations. In addition to applying a large number of magical techniques to "The Circle" offline Internet resort, allowing visitors to gain a 'magic world' experience. NOVAEX is going to build "The Magic School." World top magician teams and Chinese professional education teams are jointly researching and developing the education system for children and teenagers. In "The Magic School," magic can be applied to direct attention to physics, mathematics, chemistry and other subjects; attract children to love knowledge, learn to create; and inspire children`s intelligence and gifts. Children can learn to observe every detail of the life and become more confident. This is a creative education form different from any education system of the world. After signing with The Magic Castle, it is believed that more possibilities will be created for the integration of Chinese and Western magic and the innovative application of magic methods.